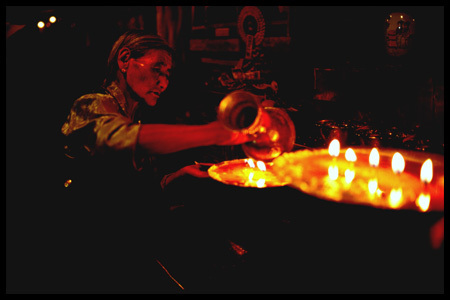 Captured with available light, this image depicts the ritual of a pilgrim pouring oil into the butter lamp pan. As little as adding some lamp oil to the eternal lamp, every pilgrim contributes whatever one could to the monastery. Standing silently beside the woman pilgrim, I was immersed in the ritual, holding the M6 steadily in my hands with the lens wide open at f1.4, although shutter was at only 1/4 of a second, the image still works.